The Institute for Family Health is a mission-driven health organization with a rich history and expert leadership. Since 1983 we have grown from a small non-profit with four staff members to one of the largest community health centers in New York State, serving over 115,000 patients annually at 30 locations. The Institute is committed to high-quality, affordable health care for all. We strive for excellence at each of our 30 practices, while accepting all patients regardless of their ability to pay. We offer primary care, mental health, dental care, social work and many other services to patients of all ages. As a federally-qualified community health center (FQHC) network, we meet national standards for affordable, accessible, comprehensive health care services. We also participate in the federal medical professional liability program known as the Federal Tort Claims Act (FTCA). We are accredited by the Joint Commission and recognized by the National Committee for Quality Assurance as a Level 3 patient-centered medical home, the highest recognition available. In addition to operating health centers, we use our expertise and resources to address racial and ethnic disparities in health, advance the use of health information technology, and find innovative ways to improve care for diabetes, depression, women’s health, HIV and other priorities in the communities we serve. We also train health students and professionals at all levels. The Institute is committed to improving the health care system, particularly for individuals and communities who historically have had limited access to care. We engage in research to improve health care services, and participate in policy development at the local, state and national levels. Interested in getting to know us better? Read our recent news, review our job opportunities or find a health center for yourself or your family. 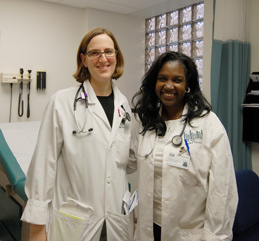 Family physicians at the Family Health Center of Harlem.